In City of Steel, Ken Kobus explores the evolution of the steel industry to celebrate the innovation and technology that created and sustained Pittsburgh’s steel boom. 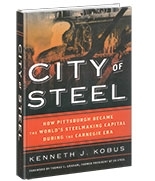 Focusing on the Carnegie Steel Co.’s success as leader of the region’s steelmakers, Kobus goes inside the science of steelmaking to investigate the technological advancements that fueled the industry’s success. City of Steel showcases how, through ingenuity and determination, Pittsburgh’s steelmakers transformed western Pennsylvania and forever changed the face of American industry and business.